Construction has officially launched for the LZ next-generation dark matter experiment. The race is on to build the most sensitive US-based experiment designed to directly detect dark matter particles. Department of Energy officials have formally approved a key construction milestone that will propel the project toward its April 2020 goal for completion. The LUX-ZEPLIN experiment, which will be built nearly a mile underground at the Sanford Underground Research Facility in Lead, South Dakota, is considered one of the best bets yet to determine whether theorized dark matter particles known as WIMPs (weakly interacting massive particles) actually exist. The fast-moving schedule for LZ will help the US stay competitive with similar next-gen dark matter direct-detection experiments planned in Italy and China. On February 9, the project passed a DOE review and approval stage known as Critical Decision 3, which accepts the final design and formally launches construction. “We will try to go as fast as we can to have everything completed by April 2020,” says Murdock “Gil” Gilchriese, LZ project director and a physicist at Lawrence Berkeley National Laboratory, the lead lab for the project. “We got a very strong endorsement to go fast and to be first.” The LZ collaboration now has about 220 participating scientists and engineers who represent 38 institutions around the globe. The nature of dark matter—which physicists describe as the invisible component or so-called “missing mass” in the universe —has eluded scientists since its existence was deduced through calculations by Swiss astronomer Fritz Zwicky in 1933. LZ will be at least 50 times more sensitive to finding signals from dark matter particles than its predecessor, the Large Underground Xenon experiment, which was removed from Sanford Lab last year to make way for LZ. 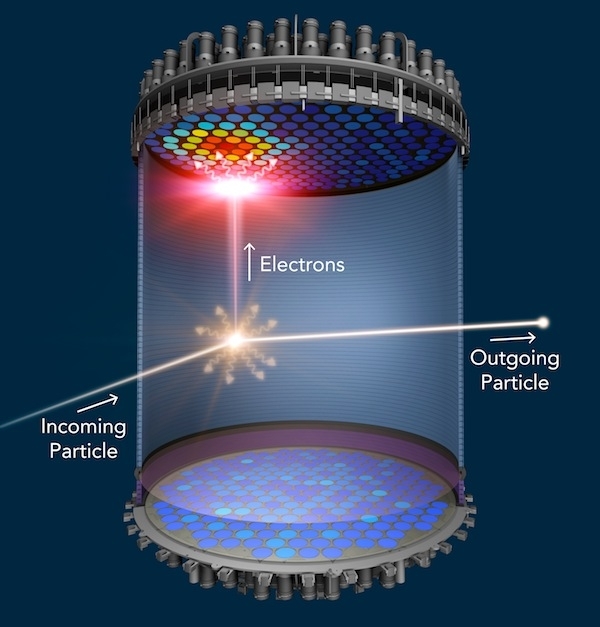 The new experiment will use 10 metric tons of ultra-purified liquid xenon to tease out possible dark matter signals. A planned upgrade to the current XENON1T experiment at National Institute for Nuclear Physics’ Gran Sasso Laboratory in Italy, and China's plans to advance the work on PandaX-II, are also slated to be leading-edge underground experiments that will use liquid xenon as the medium to seek out a dark matter signal. Both of these projects are expected to have a similar schedule and scale to LZ, though LZ participants are aiming to achieve a higher sensitivity to dark matter than these other contenders. When a theorized dark matter particle known as a WIMP collides with a xenon atom, the xenon atom emits a flash of light (gold) and electrons. The flash of light is detected at the top and bottom of the liquid xenon chamber. An electric field pushes the electrons to the top of the chamber, where they generate a second flash of light (red). Daniel Akerib, Thomas Shutt and Maria Elena Monzani are leading the LZ team at SLAC National Accelerator Laboratory. The SLAC effort includes a program to purify xenon for LZ by removing krypton, an element that is typically found in trace amounts with xenon after standard refinement processes. “We have already demonstrated the purification required for LZ and are now working on ways to further purify the xenon to extend the science reach of LZ,” Akerib says. SLAC and Berkeley Lab collaborators are also developing and testing hand-woven wire grids that draw out electrical signals produced by particle interactions in the liquid xenon tank. Full-size prototypes will be operated later this year at a SLAC test platform. “These tests are important to ensure that the grids don't produce low-level electrical discharge when operated at high voltage, since the discharge could swamp a faint signal from dark matter,” Shutt says. Hugh Lippincott, a Wilson Fellow at Fermi National Accelerator Laboratory and the physics coordinator for the LZ collaboration, says, “Alongside the effort to get the detector built and taking data as fast as we can, we’re also building up our simulation and data analysis tools so that we can understand what we’ll see when the detector turns on. We want to be ready for physics as soon as the first flash of light appears in the xenon.” Fermilab is responsible for implementing key parts of the critical system that handles, purifies, and cools the xenon. The vessels that will surround the liquid xenon, which are the responsibility of the UK participants of the collaboration, are now being assembled in Italy. They will be built with the world's most ultra-pure titanium to further reduce background noise. To ensure unwanted particles are not misread as dark matter signals, LZ's liquid xenon chamber will be surrounded by another liquid-filled tank and a separate array of photomultiplier tubes that can measure other particles and largely veto false signals. Brookhaven National Laboratory is handling the production of another very pure liquid, known as a scintillator fluid, that will go into this tank. The cleanrooms will be in place by June, Gilchriese says, and preparation of the cavern where LZ will be housed is underway at Sanford Lab. Onsite assembly and installation will begin in 2018, he adds, and all of the xenon needed for the project has either already been delivered or is under contract. Xenon gas, which is costly to produce, is used in lighting, medical imaging and anesthesia, space-vehicle propulsion systems, and the electronics industry. Kelly Hanzel, LZ project manager and a Berkeley Lab mechanical engineer, adds, “We have an excellent collaboration and team of engineers who are dedicated to the science and success of the project.” The latest approval milestone, she says, “is probably the most significant step so far,” as it provides for the purchase of most of the major components in LZ’s supporting systems. Major support for LZ comes from the DOE Office of Science’s Office of High Energy Physics, South Dakota Science and Technology Authority, the UK’s Science & Technology Facilities Council, and by collaboration members in South Korea and Portugal. Editor's note: This article is based on a press release published by Berkeley Lab.